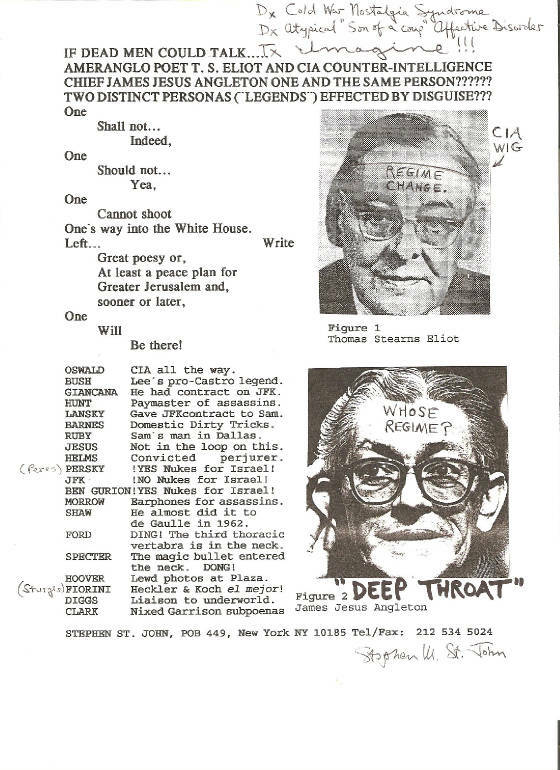 Did CIA Counterintelligence Chief James Jesus Angleton pose as the Anglo-American poet T. S. Eliot? If so, the histories of the Cold War, the Zionist state's nuclear weapons program and the assassination of JFK will have to be rewritten! The following fax broadcast, to every embassy in Washington, mission to the United Nations here in New York City, every member of the Congress of the United States as well as numerous other organizations and individuals, public and private, was designed to probe the matter. CIA Counterintelligence Chief James Jesus Angleton?